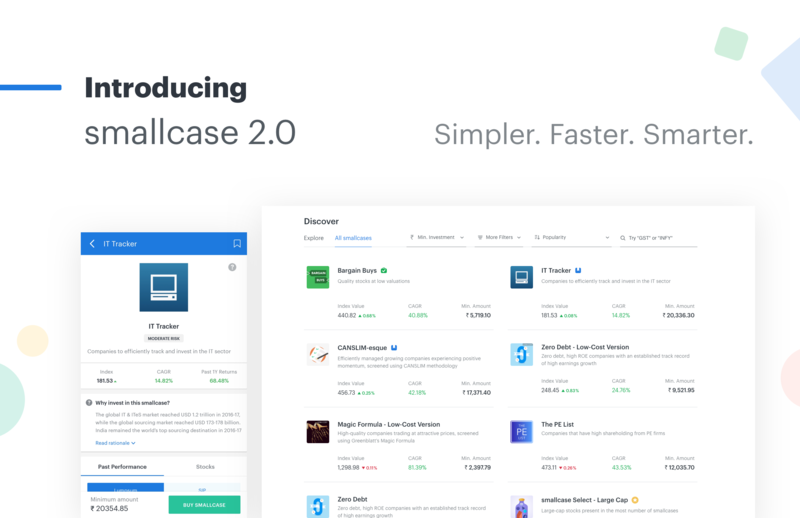 2 years ago, on this day — we launched the smallcases Platform. Thank you for being part of the smallcase community; for investing with us, spreading the word, and sharing the love. All the time, we have learned a lot from you as a team & business. These learnings about the product, the experience, the research & smallcases continue to evolve. It’s in this spirit, we’re launching the new smallcase Platform with Zerodha. Check it out here — https://smallcase.zerodha.com. It’s not just a fresh look, we have made it simpler, neater & more intuitive, based on your feedback & suggestions. The first thing you will notice about the new Dashboard is the Investment Insights section, which provides you the next steps in your smallcases journey. The information shown is based on indicators like valuation, recent performance, news, popularity & more for smallcases in your watchlist & portfolio. This section will continue to get increasingly relevant & personalized over time. You will also see all pending actions for your smallcases — Buy Reminders, SIPs due, rebalances pending on the right hand side. From both the feedback we have got, as well as studying how investors hold & perceive it, a smallcase is viewed as a long term investment product— a low-cost, transparent alternative to an equity mutual fund. Displaying the CAGR — the Compounded Annual Growth Rate for a smallcase indicates the yearly return generated by the smallcase on an average from its date of inception. CAGR represents the smoothened annualized gains of a smallcase since its inception. Time horizon for each smallcase is between today & its inception date. This implies that an investment in the IT Tracker on 3 March 2014 would have generated a yearly return of 15.01% on an average. Showing Risk Level — Stocks in a smallcase move up & down on a daily basis, resulting in fluctuations in the smallcase’s index value — the risk level (Low, Moderate, High) refers to the expected fluctuation in the index value compared to Nifty. Historical Performance of SIP — In the Past Performance section for a smallcase, there’s a SIP variant for the graph which shows the returns generated if you had invested in it via a Systematic Investment Plan each month for the time period. Placing orders for your smallcase is now seamless, and the flow can be triggered from any page. Your drafts are now part of your Watchlist, where you can also see the returns of that smallcase since you last edited the draft/added it to your watchlist and invest in it in few clicks. The Investments page also shows you any pending actions (SIP due, rebalances pending) upfront, where you can act on them instantly. 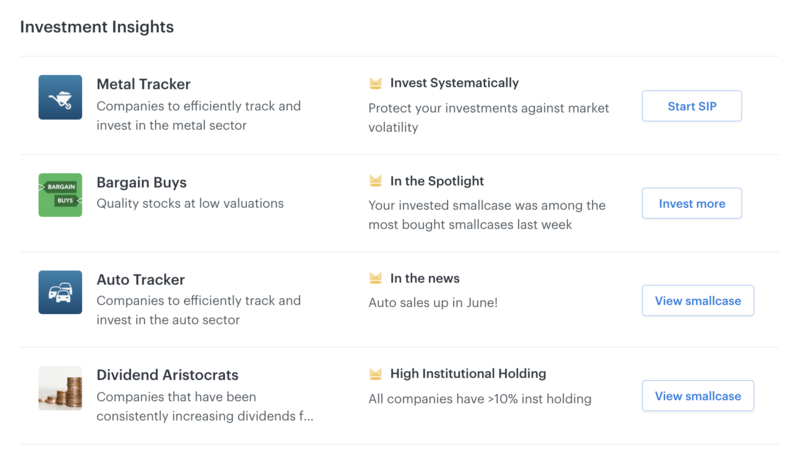 The Investment Details for your invested smallcases now shows you how your smallcase is doing along with the constituent stocks and their performance — and you can start an SIP, invest more, add/remove stocks in just 3 clicks from the same page. All smallcases are now on a flat fee structure of Rs. 100 + GST, including the Select smallcases (earlier priced at Rs. 200 + GST). These changes have been rolled out on web here & Android. The iOS app is currently live to track your investments, with the full-fledged app coming in the next few weeks. We’re releasing the new version as an open beta — we would love for you to check the new experience and let us know your thoughts, feedback, suggestions & issues, if any in the comments below, or at [email protected] so we can squash the bugs and improve the experience before we do away with the current version at the end of this month. Stay tuned for more improvements & smallcases coming in the next few weeks, we’ll keep you posted on all of them. To each & every one of you (over 1,50,000 strong now), thank you for trusting us. Hi Samir! Any stocks bought through smallcase will always be visible on Kite individually. You can use the filters on your Kite holdings page (smallcase, Kite, All) to bifurcate the stocks. Hi Samir! We don’t have call support, but you can write to us at [email protected] or login to smallcase and click on the blue button at the bottom right to start chatting with us. Looking forward to hearing from you. Hello sir, wow this one looks cool. Now does this version support BSE share adding in manual small case? Let me install n check my self although.. I was waiting for it from long time. Looks like the average cost is not getting calculated correctly. Suppose I bought 10 shares of company A for Rs. 500 through smallcase. Now when I go to kite it shows the average cost as Rs.500 which is correct. Now the price goes down to say Rs. 400. Now I bought another 10 directly from Kite. This should not change the average cost of smallcase stock. But it looks like it recalculate and says 450 as average cost for both. Is this how it is supposed to work? Please look into this. There’s a difference in the methodology used for avg buy price calculation used on Kite and smallcase. On Kite, the average buy price is calculated by FIFO for tax liability purposes. Whereas on smallcase, for easier tracking, the most direct method (without recalculating) is used for calculating the avg buy prices. Thanks for your answer. As long as both are having separate calculation, it is ok. But why are we mixing both while calculating Average cost. Is it possible to keep them separate? Hi Vijay! Not sure what you meant by “But why are we mixing both while calculating Average cost.” Currently the avg buy prices on the smallcases platform and on Kite are independent of each other. I am requesting you to provide alarms in MCX when bid gets activated and also when target completed or stop loss hits. All the three alarms to be different for identifying. In my experience it really helps all our zerodha costumers. Please try to make it. Hi Sathish! Drop us a mail at [email protected] with your questions or login to smallcase (https://smallcase.zerodha.com/) and click on the blue button at the bottom right to start a chat with us. Looking forward to hearing from you. Can’t find any chat option or ‘blue dot’. Stock information is not provided after clicking on stock. Earlier it eas there. Hi Nilesh! The stock widget that pops up upon clicking on a stock is coming soon on smallcase 2.0 as well. We’ll give you an update here once it’s live. This smallcase is designed for stock investing beginners. You can read the rationale of the smallcase to understand the underlying idea better. Super!! Its a great initiative. The look and feel is fresh. Please create an in-depth tutorial on how to make the best use of it. When I exit a holding in zerodha, it should reflect in small case. This feature not available in the previous version. Have you implemented this feature in the new version? Thank you for the revamped version of new smallcase. It’s indeed a good improvement especially the inclusion of CAGR and Risk Level data. However, I see some shortcomings of smallcases as follows. Hoping to see these improvements in very soon. Any ideas on where & how we could show this – period of worst and best performances in a month, quarter and year? I’m at vasanth [at] smallcase [dot] com – look forward to your thoughts & ideas. Thanks again! Hi Kuldeep! We’re sorry to hear that 🙁 We’d like to understand more on how we can improve. Write to us at [email protected] with your feedback, we’d love to hear from you. I am having my own portfolio scripts. Can I create a Small case and add these stocks? Is there any plan to include this feature in coming days? Is the fee of Rs.100 one time or on purchase of every small case? For all smallcases (except All Weather Investing and Smart Beta smallcases), Rs. 100 + GST on the purchase of each smallcase, but only once per smallcase. Say, you invest in the Electric Mobility smallcase, you would be charged Rs. 100 + GST when you first buy it. There are no additional charges for investing more, setting up SIP of rebalancing this smallcase. Post this, if you invest in the Magic Formula smallcase, Rs. 100 + GST would be applicable again. I have the following queries on the smallcase investment. 1. How is the Rs.50/- charged on SIP? Is it charged for every month SIP investment or only at the time of starting the SIP? 2. How is the brokerage charged on smallcase investment by Zerodha? Is it free because of the investment is delivery based equity? Rs. 50 + GST on SIP is only applicable for All Weather Investing and Smart Beta smallcases. There’s no fee for setting up an SIP. Rs. 50 + GST applicable on each SIP instalment that you pay up. Since smallcase transactions are delivery based, there would be no brokerage applicable. If i created one smallcase of IT sector and after increase shares value. Can i sell whole smallcase within 2days or i have to wait for certain period. Can i sell one of smallcase. And add another share. 2 How the tax calculation done. Can i get tax report as i receive in equity trading in kite. 3 Can i get P&L statement of each share in smallcase. 4 i am concern with report of P&L for Income Tax. It must be get in format to easy understand. 2. The tax calculation for smallcase stocks is also included in your tax P&L on Q – same as the stocks you buy directly on Kite. 3. On the smallcases platform, you can track the P&L for your smallcase as a whole as well as for individual stocks that are in your smallcase currently. For the overall P&L for each stock, you can refer to your P&L statement on Q. 4. Got it. The format for the tax P&L is the same as the other stocks you buy directly on Kite. I would like to get an answer on how weightage is maintained in a smallcase under Sip. Is there any inherent alogarithom which calculates the weightage as the prices of stocks go up or down during a particular period. Please explain with reference to a smallcase like PE list in which one has plans to invest for long term say 15years. Once you invest in a smallcase, the weighting scheme is adjusted as per the price movements. Let’s say you bought a smallcase with 5 stocks A, B, C, D and E each having a 20% prescribed weight. After investing, say, the price of Stock C and Stock E increased a lot, it might happen that your weighting scheme will become 15,15,30,15,25. So the minimum investment amount that you see while investing more will be as per this weighting scheme. Sir charges of Rs 100 is one time or every time we invest. Hi Anurag! For all smallcases (except All Weather Investing and Smart Beta smallcases) Rs. 100 + GST is only applicable when you first buy the smallcase. No additional charges for investing more. What would be the total cost to a OCI (non-citizen) for a smallcase through Zerodha? 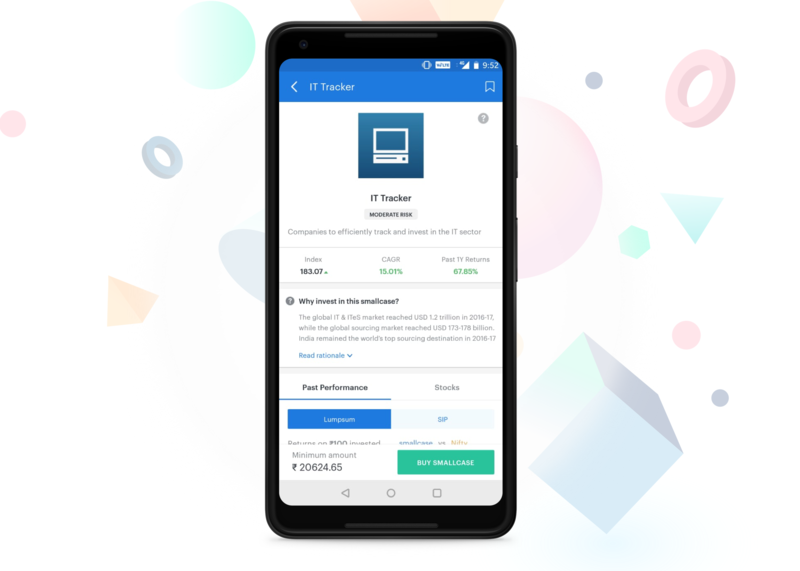 Zerodha site says it charges INR 200 per executed order ++ GST ++ Stamp Duty. Is every stock in Stock&Weight considered to be individual orders? What happens at re-balance? Would I be charged again? smallcases cost INR 100 + GST. Is it irrespective of the quantity of smallcases? The Zerodha charges for OCIs would be 0.1% OR Rs. 200 per executed order for equity (whichever is lower). This is applicable the same way as buying stocks through Kite – individually for each stock. So, if you were investing Rs. 10,000 in a stock, you would be paying Rs. 10. So, if it were for 10 stocks in a smallcase assuming the same amount in each, the Zerodha charges would come up to Rs. 100. For the All Weather Investing and Smart Beta smallcases (which you mentioned), there are no charges for buying and selling. Rs.50+9 (GST) is charged on each order of rebalancing, invest more, SIP and managing. For all other smallcases (thematic, sectoral, model-based, Select, created/customized), there’s a flat fee of Rs. 100 + GST applicable at the time of buying only. There are no additional charges for investing more, rebalancing and managing your smallcase. I have my Zerodha Account. But I am unable to login with Zerodha Kite. Login with Kite option only I selected. Kindly rectify asap. CAGR is mentioned since it started. Is there any way to find out CAGR for any desired years ? And isn’t here any concept of it’s value (like NAV)?